ELECTRIC SIGNAGE C hannel letters can be seen in mil- lions of highly visible places around the country—on everything from plazas to hotels, restaurants, malls and corpo- rate signage. They can be illuminated brightly during evenings, and don color- ful sign faces for day viewing. 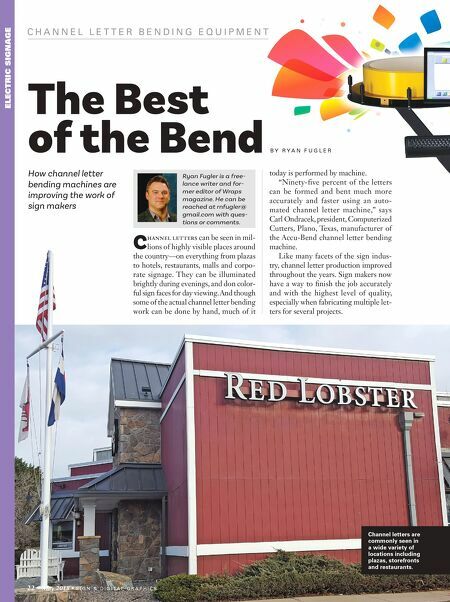 And though some of the actual channel letter bending work can be done by hand, much of it C H A N N E L L E T T E R B E N D I N G E Q U I P M E N T The Best of the Bend How channel letter bending machines are improving the work of sign makers B Y R Y A N F U G L E R Ryan Fugler is a free- lance writer and for- mer editor of Wraps magazine. He can be reached at rnfugler@ gmail.com with ques- tions or comments. today is performed by machine. 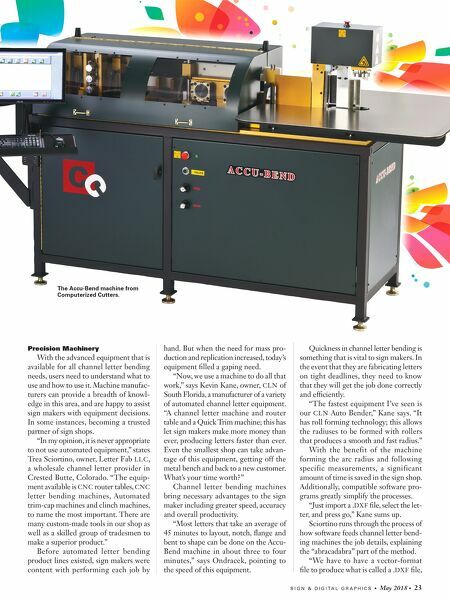 "Ninety-five percent of the letters can be formed and bent much more accurately and faster using an auto- mated channel letter machine," says Carl Ondracek, president, Computerized Cutters, Plano, Texas, manufacturer of the Accu-Bend channel letter bending machine. Like many facets of the sign indus- try, channel letter production improved throughout the years. Sign makers now have a way to finish the job accurately and with the highest level of quality, especially when fabricating multiple let- ters for several projects. 22 • May 2018 • S I G N & D I G I T A L G R A P H I C S Channel letters are commonly seen in a wide variety of locations including plazas, storefronts and restaurants.